The mystery surrounding how an electrically charged solar wind can be unleashed from around the Sun's equator - an area where strong magnetic fields should strap it to the surface - has been solved by an international team of researchers. Using data from the Hinode telescope, researchers have been studying the 'slow' solar wind, which comes from the aptly named 'equatorial belt' of the Sun where the magnetic field is strapped to the surface of our local star. The paradox has been that these equatorial regions are full of closed magnetic structures that are confined to the Sun, which should prevent gasses from escaping. Published today in the journal Solar Physics, the answer to how the slow solar wind escapes into the universe turns out to be linked to regions where the magnetic field vanishes altogether, regions called null points. 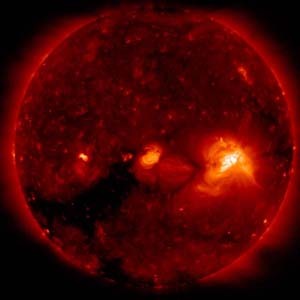 Team leader, Lidia van Driel-Gesztelyi (UCL Mullard Space Science Laboratory), explained: "The Sun is a magnetic star and we have known for a long time that the magnetic field in the atmosphere controls the flow of the gases - where they can and cannot go. At the poles of the Sun the magnetic field allows the gases to escape, but around the equator the gases should be trapped. "Our new discovery shows that that there are special configurations of the magnetic field that can undo the belt around the Sun's middle and provide the trapped gases with an escape route. Effectively opening up previously closed magnetic structures and releasing the gas they contain." In 1958 it was proposed that the temperature of the solar atmosphere is so high that even the huge gravitational attraction of the Sun cannot hold it down, resulting in a supersonic wind that constantly blows outward. This out-flowing solar wind is gusty and sometimes it blows fast, and sometimes slow. The source of the fast solar wind originates from regions where the Sun has very extended or 'open' magnetic field structures that reach out to vast distances in the solar system. The hot and electrically charged gases of the Sun's atmosphere are channelled along these magnetic field lines out into space. The slow solar wind is twice as dense as the fast solar wind and more variable in speed. However, the Earth, and all other planets, spend most of their time immersed in the slow solar wind. Luckily most of the wind blows over us as we are protected our own magnetic field created inside the Earth. But planets like Venus and Mars - with no magnetic field - have their atmospheres stripped away. The solar wind continues to blow out into the solar system until stopped by the pressure of the gas between the stars. Together, the closed and open regions of the Sun's magnetic field create a complex web that envelops the Sun in a series of structures resembling domes and drawn out threads. Since it is not possible to measure or see this web directly, the team created a computer model constructed from real data. The model allows the study of where and why the gases flow. Lidia van Driel-Gesztelyi said: "The Sun's magnetic field and atmosphere are very different to what we experience at the Earth. The Sun's atmosphere is electrically charged which means that the particles are trapped by the magnetic field - the magnetic field acts as a tube along which the gases flow. But the magnetic fields themselves are dynamic. They can stretch out like elastic bands and also snap apart and then connect up with neighbouring magnetic fields." In this study, the researchers found evidence that the magnetic web around the equator can consist of null points. Null points are interesting features and even though they are effectively empty regions, magnetic fields can pass through them. As the magnetic fields pass through they experience a change that turns them from being closed structures to open structures. During this process, gases can then be transported high enough to escape along these open magnetic structures that act as chimneys sending the gases of the solar atmosphere into the solar system. Previous work by some of the team members showed how upward gas flows can be generated in the solar atmosphere in the first place. Combining this with the new results means that the team are now able to say which regions of the equatorial belt will produce gas flows that make it all the way out into to the solar wind, and which will be confined to the Sun, creating a unified model of the solar atmosphere/ slow solar wind flows.